Elizabeth Smart said she’s been told that a federal agent will keep a “close eye” on one of her former kidnappers, Wanda Barzee, who is set to be released Wednesday from the Utah State Prison. Smart told “CBS This Morning” in an interview broadcast Tuesday that she’s already met the federal agent who will be supervising Barzee and that Barzee would be returned to the lockup “as soon as she messes up.” Smart is unhappy that Barzee is being freed, believes the woman is still dangerous and is counting on the federal probation to help keep her family safe. Barzee was convicted of federal and state crimes related to the 2002 kidnapping of Smart, and her 15-year prison sentence is expiring Wednesday. She will then have to serve 60 months of federal supervision, often called probation. 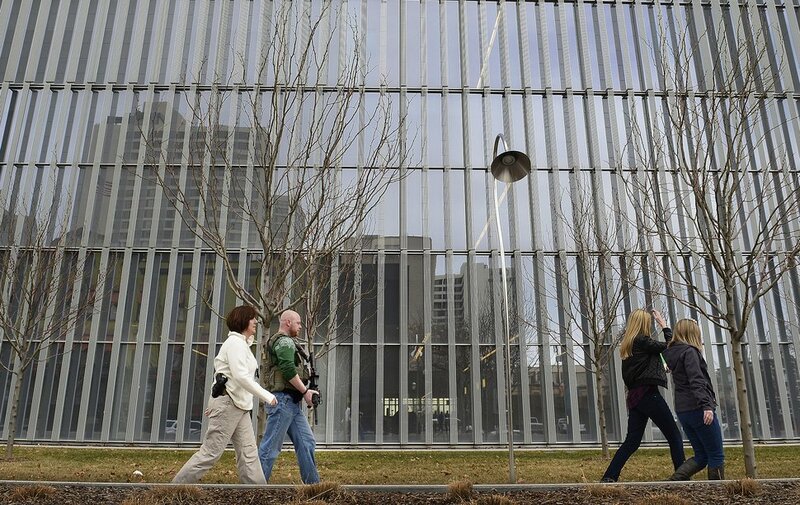 Scott Sommerdorf | The Salt Lake Tribune Federal officers walk outside the federal courthouse in Salt Lake City on Feb. 6, 2015. Whether Barzee is incarcerated again won’t necessarily be up to the federal agent, said Bob Thornton, a retired federal probation supervisor. “The goal is to hopefully reintegrate the person back into society,” Thornton said. That means monitoring to make sure the probationer hasn’t committed new crimes, Thornton said. And the federal agent can arrest a probationer on the spot if the agent has the same probable cause any police officer needs to make a bust. But failure to comply with terms of the supervision is something that is typically reported to the judge, Thornton said, so the court can make a decision of whether to send the probationer back to prison for the remainder of the term or take some alternative approach. If called before the judge, the probationer would then have an opportunity to explain himself or herself. In Barzee’s case, the terms include completing mental health treatment — something she refused to do when she was serving her state sentence at the prison in Draper. Barzee also must have no direct or indirect contact with Smart and must comply with standard probation terms, such as reporting to her assigned agent and informing the agent of where she is living and working. She also must submit to home inspections. John Huber, the U.S. attorney for Utah, said a federal probation officer has far fewer cases to keep track of compared with local agents who work for the state. Why is one of Elizabeth Smart’s kidnappers being released from a Utah prison? Here are answers to six big questions. Smart’s CBS interview covered much of the same ground as her 2010 testimony in federal court. “I don’t know, just the feeling that kind of radiated from her,” Smart told the network. “It just was dark. And it was evil. And I just knew that she — she wasn’t there to help me, that she wasn’t there to protect me. Reporter Jessica Miller contributed to this article.